Hello friends! 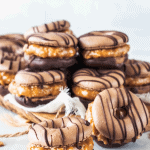 Today let’s make Samoa Cookie Macarons, my special new macaron recipe! As you know, I love making macarons! 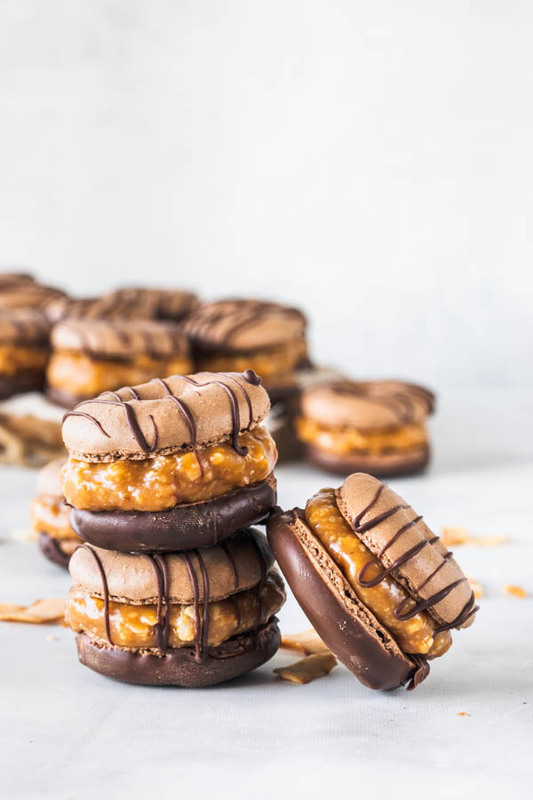 From all of the Girl Scout Cookies, my favorites are the Samoa Cookies. And initially, I wanted to make a recipe for homemade Samoa Cookies. That’s when I had the sudden realization: why not make it a macaron recipe, and a Samoa cookie recipe, all in one? 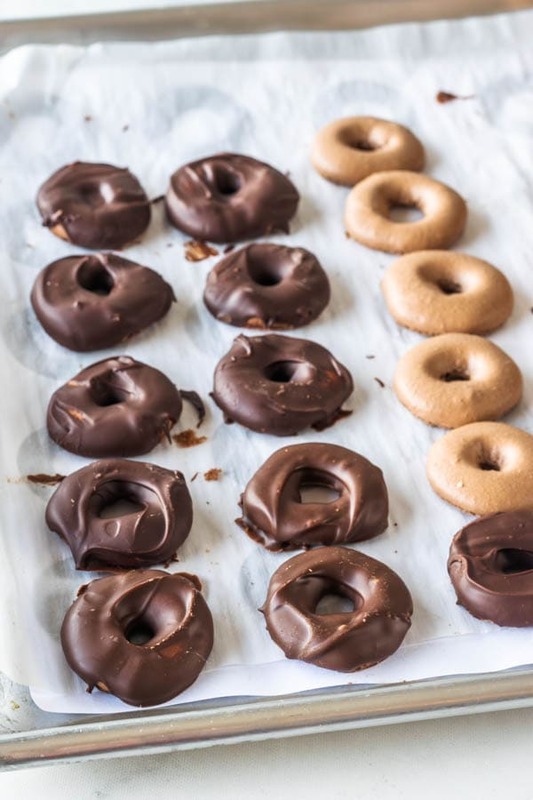 I made the macaron shells into donuts, to keep the shape of the original Samoa Cookies. 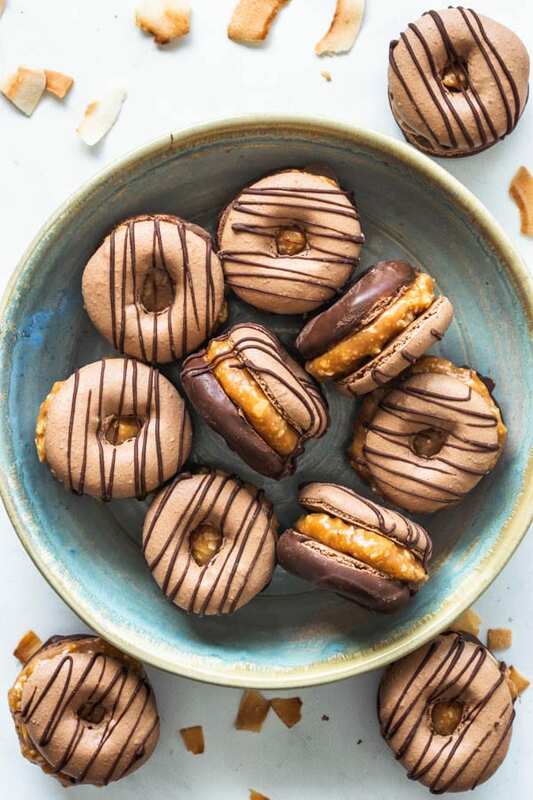 I have a template of the donut macarons here for you. 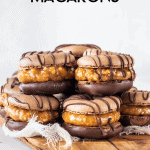 Click below to download the pdf for the Donut Macaron Template. Basically you go about making the macaron the same way, and when you pipe the batter, make sure to pipe an even ring. Let macarons dry, as usual. I let mine dry for about 20 minutes depending on how dry or humid the weather is. It’s usually pretty dry where I live. 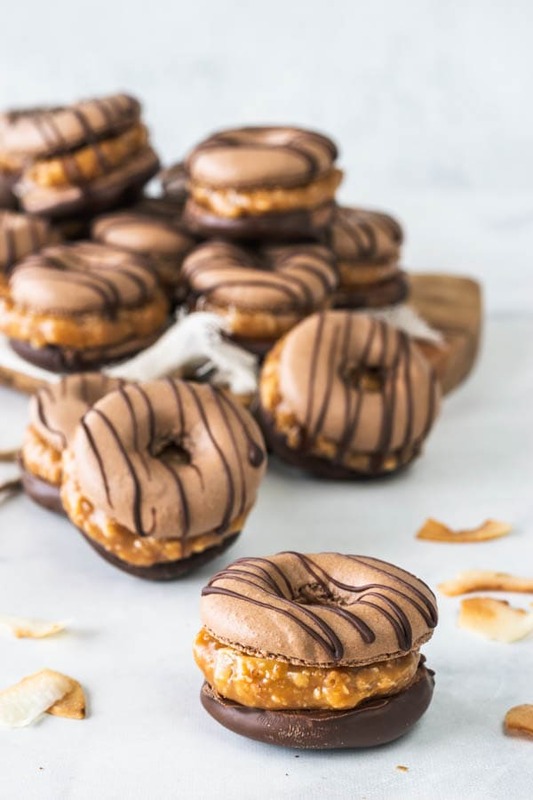 These donut shaped macarons were so fun to make I want to create more flavors with this shape! After you bake your macarons, once they have cooled down, you may start dipping half of the batch in melted chocolate. That’s when I thought: those Samoa Cookie Macarons are coming out just fine! Not to mention the caramel. This toasted coconut caramel is for the Gods. Seriously no kidding, best thing ever! You are going to want to eat it by the spoonfuls. And remember to quickly place the top shell of the macarons, before the caramel starts to dry and set. Because then, the top shell won’t stick to the caramel. Well, before the drizzle of chocolate, which I didn’t photograph because I was probably too happy doing a dance of how beautiful my macarons had turned out. Yes I’m proud of them. Seriously, check out that thick caramel filling. Tell me these aren’t the best! Now, if you like these Samoa Cookie Macarons, you might want to check out some more of my French macaron recipes. 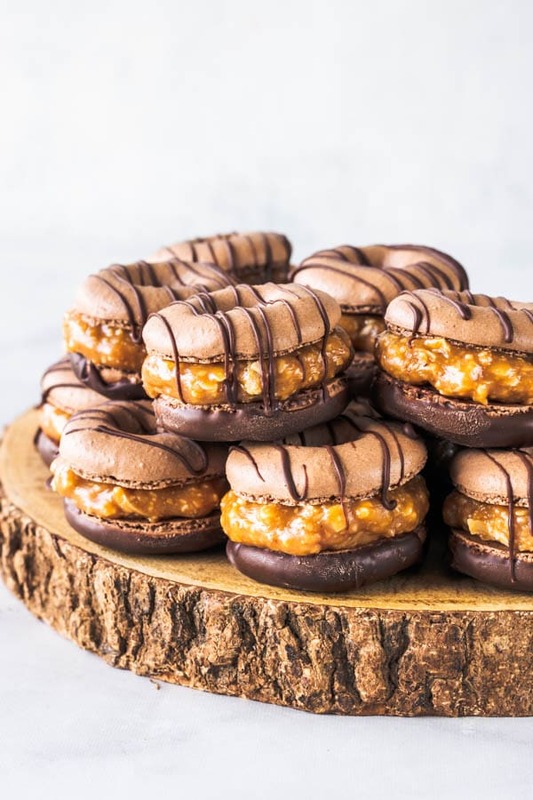 These Samoa Cookie Macarons just made my favorites list, also! You can imagine why. I absolutely love caramel, dulce de leche, and chocolate anything! I will confess, I put them on top of cupcakes. Check back tomorrow for the recipe of my Samoa Cupcakes! If you are new to making macarons, check out my Matcha Macarons post, where I go over some main tips and techniques. On my Raspberry Macarons post, I talk about Almond Flour, brands, sifting methods, etc. On my Espresso Macarons post, I answer common questions about making macarons. On my Lemon Macarons post, I talk about macaron shelf life and storage. Check them out! And also, there are tones of other resources online that can help you. Have a great day and thanks for reading my blog. 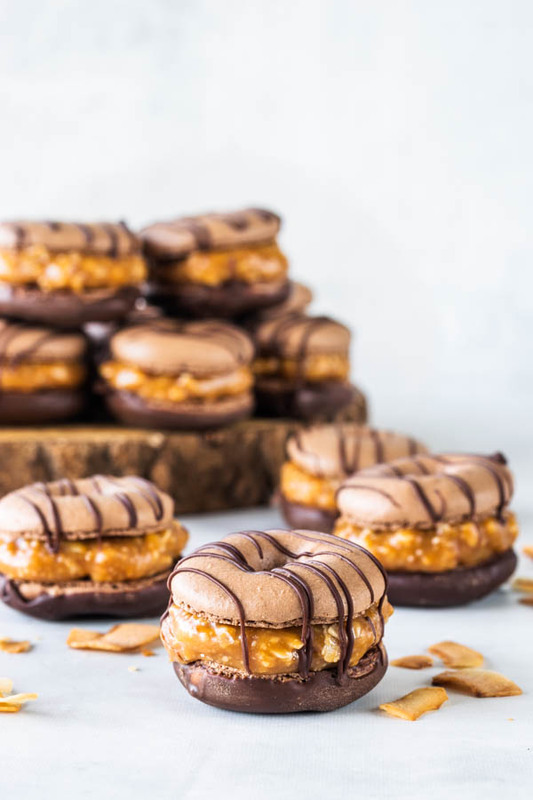 Do you love the famous Girl Scout Cookie Samoas? 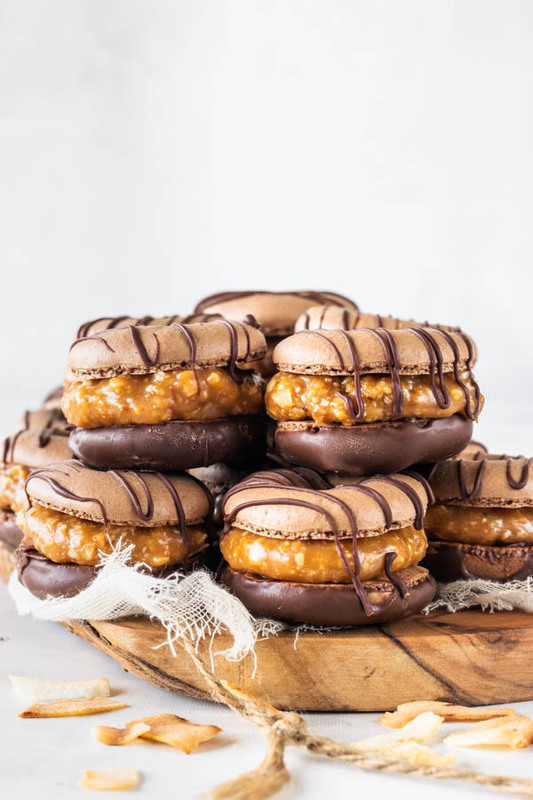 Then you will love these Samoa Cookie Macarons! 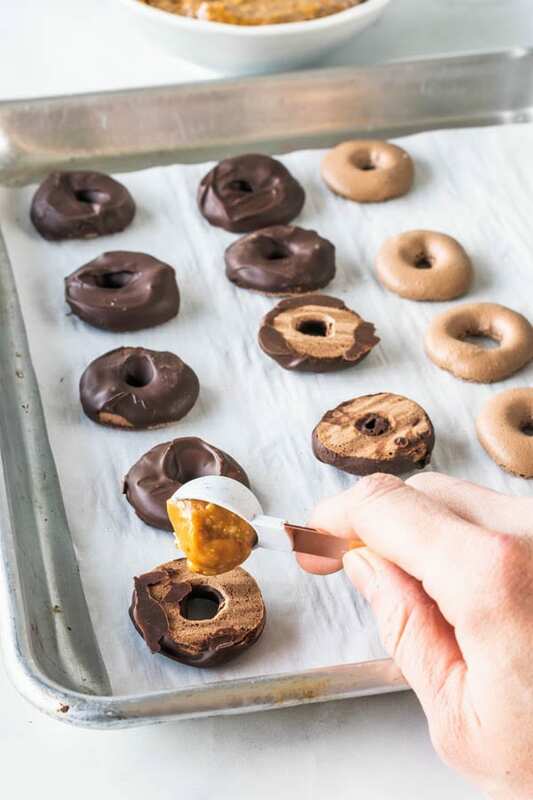 The bottom is dipped in chocolate, filled with a toasted coconut caramel, and with a drizzle of chocolate on top. Sift powdered sugar, almond flour, and cocoa powder together. Set aside. Place egg whites and granulated sugar in a heat proof bowl or in a double boiler. Over a pan of simmering water, whisk the whites and sugar until frothy and sugar completely melted. It will take a couple minutes. Start folding gently forming a letter J with a spatula. First, I pick up some batter with my spatula and try to form a figure 8. If the 8 forms without the batter breaking up, that’s one indication that it might be ready. 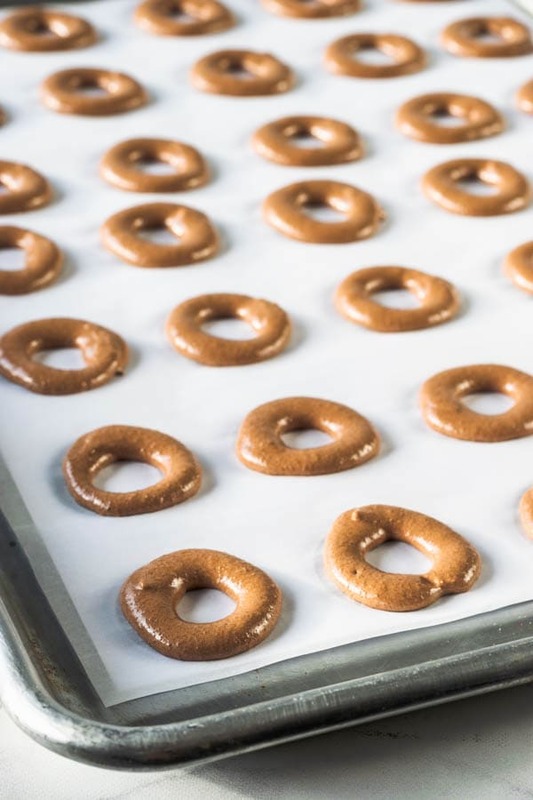 Once you’ve piped as many 1 1/2” disks as you could (check the post above for a template of the donut shape macaron), bang the trays against the counter a few times each. 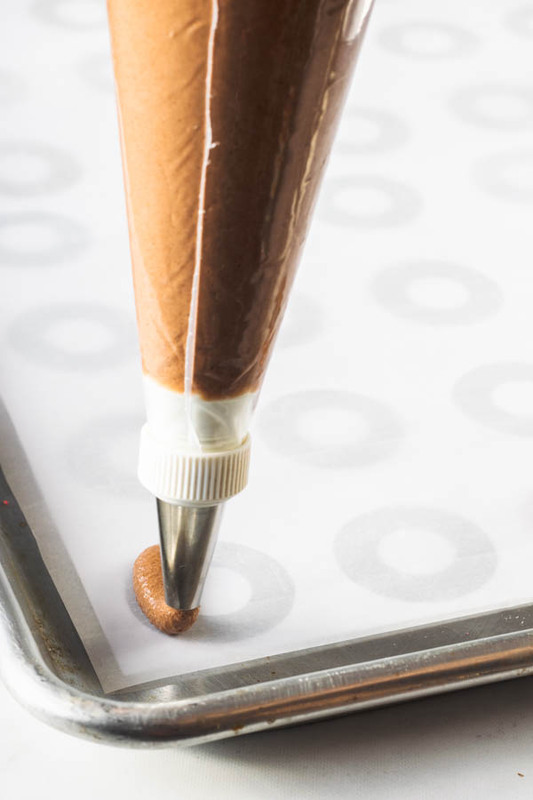 This will release air bubbles that are in the batter and prevent your macaron shells from cracking. Mix caramel candies, coconut flakes, and heavy cream in a small saucepan. Place pan over medium heat, and stir constantly while the caramels melt. Keep stirring until the caramels have completely melted. Set mixture aside to cool. You want it to be at room temperature at the time you assemble your macarons. If the caramel mixture is cold from the fridge, simply let it sit at room temperature until it has softened. Melt chocolate in the microwave, 30 seconds at a time, stirring in between, until the chocolate has completely melted. Dip half of the macaron shells in melted chocolate. 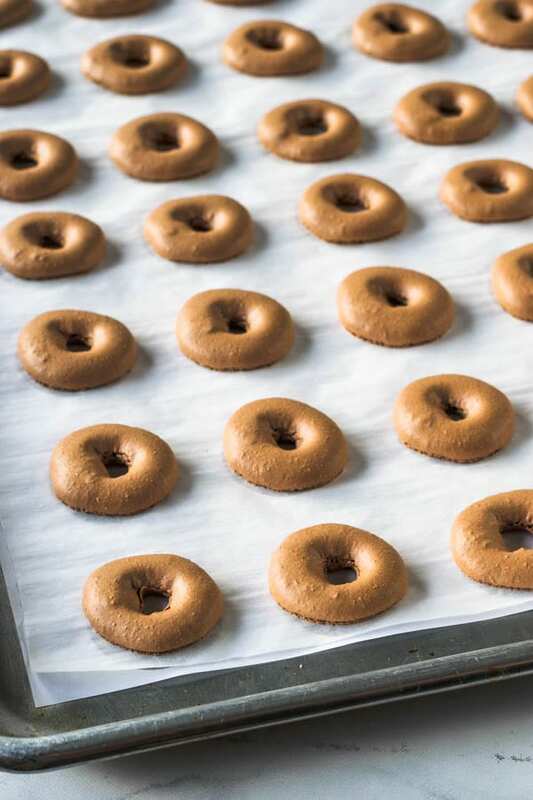 Let them sit, on a parchment paper lined pan until completely dry. You can put shells in the fridge to speed up this part. 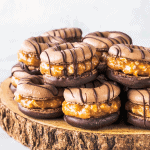 Place about 1 teaspoon of caramel filling on top of the chocolate covered macaron shell. Place remaining melted chocolate in a pastry bag (you may need to re-melt it if it has been sitting for a while), cut a little hole at the end, and drizzle some of the melted chocolate on top of macarons. Let macarons mature in the fridge overnight before serving. Best served at room temperature, or after sitting out of the fridge for about 15 minutes. Macarons will freeze well. Keep them in the freezer, in an air-tight container, for up to 1 month. Macarons will keep in the fridge for up to 1 week. To toast the coconut flakes, simply spread them in a non-stick pan, and place over medium heat. Keep swirling the pan around, and tossing the coconut flakes, so they brown evenly. Do this for a few minutes until your coconuts are toasted and brown. Seus doces são maravilhosos Ca, muito mais que fantásticos!!!!!!! Simply gorgeous! worth all the effort! Perfect step by step tutorial – thanks! So scrumptious! 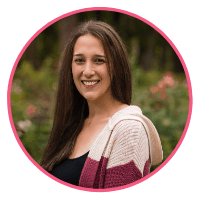 Love your bakings Camila and happy that you also have vegan, gluten free, paleo, etc., options on your blog m. Something for everyone!!!. Thank you so much, Mary!! I appreciate it! These may be my favorite yet! I love Samoa’s! I have a list as long as my arm of all the treats on your site that I want to make! But these are now topping that list! I’ve never made macarons, but I’m starting with these. 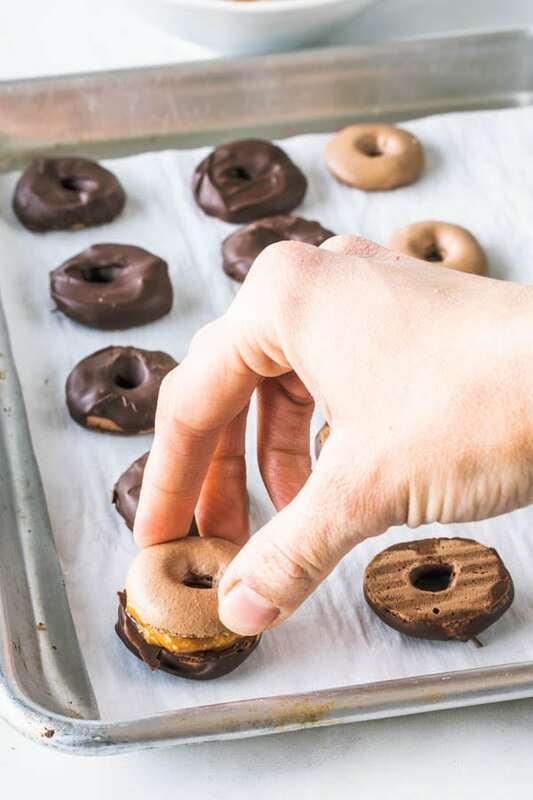 They just look too darn delicious not to make! And that caramel filling really looks amazing! haha Leanne you’re the best. thanks for the support!! these sound scrumptious! i was wondering what brand of caramel candies do you use? I used Werther’s 🙂 thank you so much.